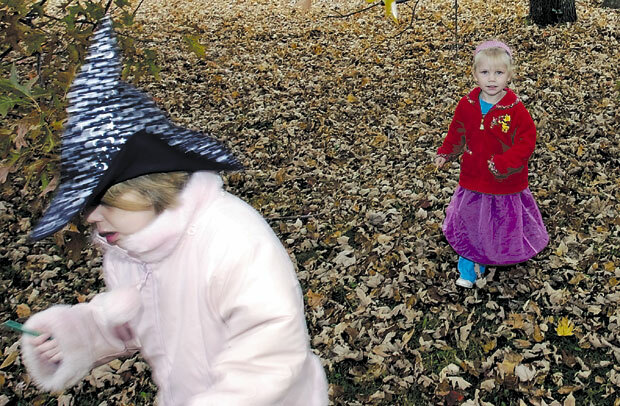 Adrianna Wren, 7, and her sister Summer, 3, race back to the starting point after finding objects from a scary scavenger hunt at the Halloween Spooktacular on Saturday. The event was sponsored by the Unity Barn Raisers and Unity College, and had plenty of activities to keep kids having spooky fun all day at the Unity Community Center. Richard Miner of Unity only wanted a cup of coffee when he walked into Dunkin' Donuts on College Ave. in Waterville, but he got zombies, too. Chris Osgood of Hallowell spooks out Miner while Jarody waits in the shadows. About a half dozen Zombies showed up for coffee after a failed kickball game at Railroad Square Cinema Saturday evening when the cinema had a special showing of "Night of the Living Dead."